Do I need to register staff just to work in the booth? What is the cost? My company sponsors a special event. Do I still need to register to attend that particular event? How much does it cost to attend this event? I just registered. How do I know it went through? I registered as booth personnel. Can I upgrade to a Conference & Trade Show Package? How can my customers attend the Show for free? How can I market my booth to current and potential customers? What are the New Exhibitor Pavilion hours? Are furnishings and utilities included in the cost of my exhibit space? Can I drive up to the loading docks and unload my own vehicle? My display equipment is mounted on wheels and doesn’t require a dolly or roll cart. Can I unload and roll my materials to my booth from the loading dock? What is considered a “privately owned vehicle”? What can be unloaded or loaded from privately owned vehicles? Who can unload a privately owned vehicle? How much time will I have to unload my vehicle? My freight will fit in a truck. Can I drive that truck into the Convention Center, unload and leave with it? What can I carry in or out myself? Which unions provide services and jurisdictions at Indiana Convention Center? What can we do to set up our booth? Can I set up my booth the morning the Show opens? If I have a problem with Show rules, a contractor or union labor, with whom should I speak? Aren’t the official service contractor (Freeman) and the union the same thing? The union employees are unsatisfactory. What can I do? What can the union do if I refuse to comply with their rules? What can NTEA do if I refuse to comply with union and/or Show rules? I use an Exhibitor-Appointed Contractor (EAC). How can I make sure my EAC is approved to work inside Indiana Convention Center? What time will my Exhibitor-Appointed Contractor (EAC) be able to set up my booth? Why are vehicles and heavy equipment scheduled to move in at specific times, and why do I have to wait at the marshalling yard? My booth isn’t assigned a target time, but I plan on displaying heavy equipment. What should I do? What happens if I miss my target move-in time? Where can I park/store my empty trailer during Show days? How are material handling fees determined? If I think I am being overcharged for freight, what can I do? What is a Material Handling Agreement? If my booth is damaged during move-in or move-out, what can I do? Why does it take so long to have my empty containers/crates returned after the Show? I don’t plan to move out on closing day. Will my booth and its contents be secure? Will meeting rooms be available for exhibitors? How can my company arrange a press conference for a new product reveal or announcement? How can my company be included in The Work Truck Show Ride-and-Drive? Do I need to register staff just to work in the booth? What is the cost? Yes. Everyone needs to have a Work Truck Show badge to enter the exhibit hall, including attendees and booth staff. There is no limit to the number of booth personnel that can be registered, and there is no cost for booth-only registrations. My company sponsors a special event. Do I still need to register to attend that particular event? Yes. However, exhibiting companies that sponsor $5,000 or more do qualify for credits that can be used toward registration fees. Please contact NTEA Director of Member Services Luci Pfaff at 248-479-8148 or luci@ntea.com to find out if your company qualifies for sponsor credits. How do I register for the Show? Register online, download a registration form and fax to 248-489-8590, or call 800-441-6832 for assistance. How much does it cost to attend this event? There are different registration options available to fit your needs, including booth-only access and conference packages. View registration prices or call 800-441-6832 to learn more. I just registered. How do I know it went through? Whether you register online, through fax, mail or phone, you will receive a confirmation notice via email within one week. Your Work Truck Show badge will be waiting for you on-site at registration. If you have any questions concerning your registration, call 800-441-6832. I registered as booth personnel. Can I upgrade to a Conference & Trade Show Package? Yes, you may upgrade your registration package or add other options online, by email at registrar@ntea.com or by fax to 248-489-8590. All changes or cancellations must be received in writing. You will receive confirmation of these changes within one week. How can my customers attend the Show for free? Give your best customers, prospects and distributors the opportunity to attend The Work Truck Show 2019 with a Free Pass that provides complimentary registration to attend all three days of the trade show, and entitles users to attend one concurrent educational session. These passes can be shipped to you or a customized PDF can be sent electronically. To request Free Passes, contact NTEA Executive Assistant and Office Manager Pam Appicelli at 248-479-8903 or pam@ntea.com. How can I market my booth to current and potential customers? For more information, contact NTEA Event Sales Manager Sarah Kindinger at 248-479-8919 or sarah@ntea.com. What are the New Exhibitor Pavilion hours? New Exhibitor Pavilion will be open Wednesday, March 6 and Thursday, March 7 from 9 a.m.–4 p.m.
Are furnishings and utilities included in the cost of my exhibit space? No. Standard booths include back and side drapes, one 7-inch by 44-inch identification sign, and a booth identification floor sticker. New Exhibitor Pavilion is carpeted; no additional floor covering is required. Details on products/services are available at worktruckshow.com/exhibitorservices. Can I drive up to the loading docks and unload my own vehicle? No. The unloading or reloading of any freight into exhibition areas by any and all private vehicles and contracted carriers from the marshalling yard and loading docks will be managed by Freeman, and exhibitors will be charged the established rates for material handling. If you have any questions about the loading dock area, please call Freeman Exhibitor Services at 773-473-7080. For your convenience, a predetermined overhead door (not a loading dock) will be available for exhibitors to unload/load booth materials from a privately owned vehicle. This designated area will be available on a first-come basis for personally owned vehicles NOT being displayed as part of an exhibit. Exhibitors may use this location free-of-charge only to unload their vehicles. The use of personally owned dollies, roll carts and flat trucks is permitted. Exhibitors may not borrow tools, ladders or other equipment from the Indiana Convention Center or Freeman. Forklift services will not be provided in New Exhibitor Pavilion. My display equipment is mounted on wheels and doesn’t require a dolly or roll cart. Can I unload and roll my materials to my booth from the loading dock? No. The unloading or reloading of any freight into exhibition areas by any and all private vehicles and contracted carriers from the loading docks will be managed by Freeman, and exhibitors will be charged the established rates for material handling. If you have any questions about the loading dock area, please call Freeman Exhibitor Services at 773-473-7080. For your convenience, a predetermined loading ramp with overhead door (not a loading dock) will be available for exhibitors to unload/load booth materials from a privately owned vehicle. This designated area will be available on a first-come basis for personally owned vehicles NOT being displayed as part of an exhibit. Exhibitors may use this location free-of-charge only to unload their vehicles. The use of personally owned dollies, roll carts and flat trucks is permitted. Exhibitors may not borrow tools, ladders or other equipment from the Indiana Convention Center and/or Freeman. Forklift services will not be provided in New Exhibitor Pavilion. What is considered a “privately owned vehicle”? Typical vehicles a family or small business may operate for transportation or light hauling, including automobiles, pickup trucks, minivans, full-size vans and sport utility vehicles are considered privately owned. This does not include multiple-axle vehicles, flatbed trucks, box vans or trailers. What can be unloaded or loaded from privately owned vehicles? Equipment, displays or other event-related materials that fit into the vehicles and can be transported by the owner or employee by hand or with use of a fully-manual cart or dolly. Due to safety concerns and to maintain an orderly flow during load-in and load-out periods, exhibitors and their employees are not allowed to use forklifts, pallet jacks, motorized dollies or similar motorized or hydraulic equipment to load, unload or transport materials on Indiana Convention Center property. Forklift services will not be provided in New Exhibitor Pavilion. Who can unload a privately owned vehicle? Either exhibitors or full-time employees of the exhibiting company may unload the vehicle. In order to use the designated privately owned vehicle area, eligible exhibitors and their employees must work in a team of at least two people. There must be a driver who stays with the vehicle at all times and is immediately available to move the vehicle in addition to at least one person to transport the materials to and from the exhibit. This will help speed up access for others who wish to use this convenience and prevent vehicles from being boxed in. How much time will I have to unload my vehicle? The time allotted for privately owned vehicles will be no more than 20 minutes. My freight will fit in a truck. Can I drive that truck into the Convention Center, unload and leave with it? No motorized vehicles will be permitted in New Exhibitor Pavilion. What can I carry in or out myself? Exhibitors are permitted to use personally owned dollies, roll carts and flat trucks to carry items into the exhibit facility. Exhibitors may not borrow tools, ladders or other equipment from the Indiana Convention Center and/or Freeman. This does not apply to any loading dock area. The unloading or reloading of any freight into the exhibit hall by any and all private vehicles and contracted carriers from the loading docks will be managed by Freeman, and exhibitors will be charged the established rates for material handling. Please refer to the Union Jurisdictions at Indiana Convention Center documentation found in this manual. For your convenience, a predetermined loading ramp with overhead door (not a loading dock) will be available for exhibitors to unload/load booth materials from a privately owned vehicle. This designated area will be available on a first-come basis for personally owned vehicles not being displayed as part of an exhibit. Exhibitors may use this location free-of-charge only to unload their vehicles. Which unions provide services and jurisdictions at Indiana Convention Center? What can we do to set up our booth? Freeman has an agreement with a local union through Indiana Convention Center to provide labor for display installation and dismantling. Full-time employees of the exhibiting companies, however, may install/dismantle their own exhibits without assistance from this union. Any labor services that may be required beyond what your regular, full-time employees can provide must be rendered by the union. Labor can be ordered in advance or on-site at the Freeman Service Desk, located in the Exhibitor Services Center (Rooms 143–145). For more information, please refer to the Union Jurisdictions at Indiana Convention Center documentation found at worktruckshow.com/exhibitorservices. Can I set up my booth the morning the Show opens? No. All exhibits must in place by 2 p.m. the day prior to the Show opening (Tuesday, March 5, 2019), unless special arrangements are made in advance, in writing, with NTEA Show Management. Can I share my booth with another company? No. Assigned booth space is for the exclusive use by the contracted exhibiting company only. Sharing/sub-leasing booth space is not allowed. See your booth contract for specifics. If I have a problem with Show rules, a contractor or union labor, with whom should I speak? Prior to arriving on-site, contact NTEA Director of Events Michelle Kubitz at 248-479-8192 or michellek@ntea.com. If a problem arises on-site, contact NTEA Show Management immediately. Please do not wait until after the Show is over. Issues are much easier to resolve as they occur, rather than after the event. Aren’t the official service contractor (Freeman) and the union the same thing? Freeman, the Official Service Contractor hired by NTEA, provides material handling, decoration, rigging, carpentry and freight movement. The tradespeople, or union, who perform these functions are hired by Freeman. The union employees are unsatisfactory. What can I do? Ask employees to accompany you to the Exhibitor Services Center (Rooms 143–145) immediately and inform a customer service representative about your situation. They will help you resolve the problem. What can the union do if I refuse to comply with their rules? They can, with the force of the law behind them, shut down the Show. What can NTEA do if I refuse to comply with union and/or Show rules? Your booth contract clearly states you must conform to union contract rules and regulations as well as all Show rules and regulations. Failure to do so violates your contract, and NTEA Show Management can eject your company from New Exhibitor Pavilion. The no-refund policy on booth space, furnishings, labor, etc., would apply. I use an Exhibitor-Appointed Contractor (EAC). How can I make sure my EAC is approved to work inside Indiana Convention Center? Any EAC not pre-qualified with Indiana Convention Center should complete the documentation required by Indiana Convention Center. Failure to have your EAC pre-qualified can result in denied access to exhibition areas and costly delays. Please refer to the EAC information at worktruckshow.com/exhibitorservices. What time will my Exhibitor-Appointed Contractor (EAC) be able to set up my booth? Your display house will be allowed to access the exhibition area at your assigned or targeted move-in time. EACs will not be allowed to enter exhibit areas and work in your booth until then. What is a marshalling yard? A marshalling yard allows carriers to check-in and station themselves at a location close to the Show site and await their call for delivery. There is only room for a certain number of vehicles at the Convention Center loading docks, and the marshalling yard helps relieve congestion and traffic. Why are vehicles and heavy equipment scheduled to move in at specific times, and why do I have to wait at the marshalling yard? The target check-in schedule is designed to minimize your driver’s/carrier’s time in the marshalling yard and make move-in of freight, display vehicles and trailers most efficient. It is scheduled by booth location, so freight and vehicles are moved in based on keeping a clear path and progression from the loading docks. As noted on the target check-in floor plan, each booth exceeding 300 square feet is given a specific time. A large number of exhibitors are scheduled within each timeframe. While your shipment or display vehicle(s) is due at the marshalling yard at your targeted check-in time, it may take some time before you are called to deliver to Indiana Convention Center. The shipments and/or display vehicle(s) will only be called to Indiana Convention Center when space is available. My booth isn’t assigned a target time, but I plan on displaying heavy equipment. What should I do? Please contact Lisa McGuinness at Freeman Freight Department (773-473-7436 or lisa.mcguinness@freemanco.com) for a target time assignment. Freeman and Show Management must be notified if you wish to display heavy equipment in New Exhibitor Pavilion. What happens if I miss my target move-in time? Late arrivals may be subject to additional labor charges if booths surrounding yours have already been set up and need to be taken down or moved for you to obtain access to your booth. You are strongly advised to adhere to your scheduled check-in and move-in time. Where can I park/store my empty trailer during Show days? Please view a map of accessible parking locations. Any charges associated with parking are at the expense of the exhibitor. 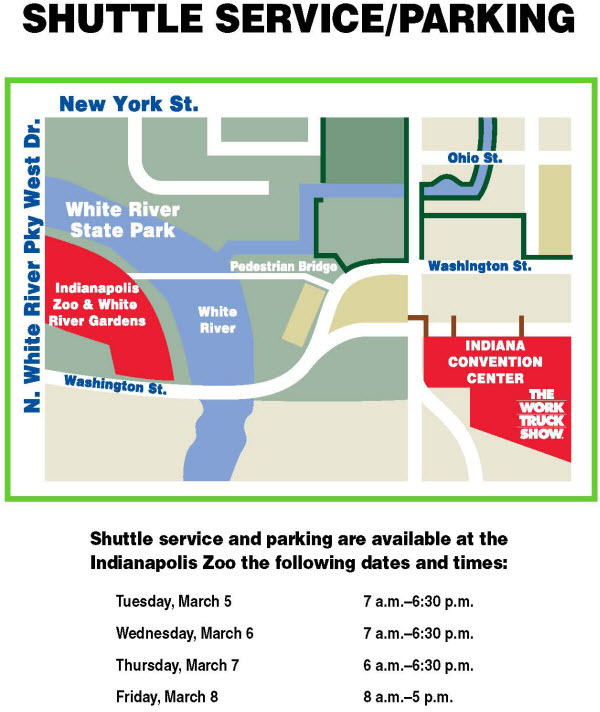 Parking is also available on a first-come basis at Indianapolis Zoo, located near the Convention Center, at 1200 W. Washington St., Indianapolis, IN 46222. Shuttle buses will loop from Indiana Convention Center to the Indianapolis Zoo parking lot Tuesday through Friday. Parking will still be available Sunday, March 3 through Monday, March 4. For your convenience, NTEA is offering this parking and shuttle service free of charge. How are material handling fees determined? There are different rates for advance shipments, those sent direct to Indiana Convention Center, crated freight, uncrated freight, etc. If you have questions, contact Freeman Exhibitor Services for clarification at 773-473-7080. Be sure you have a weight certificate. In-and-out rate is based on incoming rate only. If I think I am being overcharged for freight, what can I do? Talk to a Freeman Exhibitor Service Representative for an explanation of the various rates. If there is a question as to the weight of your shipment, they will have a solution. If you do not feel their explanation is satisfactory, please contact an NTEA staff member and ask for help. For best results, problems need to be resolved as they occur on-site. What is a Material Handling Agreement? A Material Handling Agreement is a document showing the exact piece count, weight and types of materials being shipped. This document is required by Freeman to load your outbound shipments onto the various carriers. Outbound shipments handled by Freeman will not go out until Friday, March 8, 2019. Domestic expedited shipping services will be available on Thursday, March 7, 2019 through the Ricoh Business Center located in Indiana Convention Center. If you have questions, contact Ricoh Business Center at 317-262-4435. If my booth is damaged during move-in or move-out, what can I do? Unfortunately, accidents do happen. As an exhibitor, you are strongly encouraged to insure your booth and its contents from the time they leave your facility. In the event your booth is damaged during move-in, the contractor will help get your booth ready for the Show. Immediately contact the party you believe is responsible for the damage and file a report at the Exhibitor Services Center (Rooms 143–145). Why does it take so long to have my empty containers/crates returned after the Show? Empty containers are stored in trailers parked off-site from Indiana Convention Center. There are numerous trailers required to accommodate hundreds of empty containers. Containers will be delivered as quickly as possible, between 4–6 p.m. on Thursday, March 7, 2019. Will meeting rooms be available for exhibitors? If you would like to host an event or reserve meeting space at Indiana Convention Center or one of NTEA’s hotels, please contact Jenelle Warner, NTEA senior event manager, at 248-479-8195 or jenelle@ntea.com. She will review your request and connect you with the appropriate contacts. When requesting a hospitality event or meeting space, please have the following information available: date, time, anticipated number of people and type of event you would like to host. How can my company arrange a press conference for a new product reveal or announcement? All press conferences and media events, whether held in your booth, the NTEA-provided Press Conference Room or off-site, must be approved in advance by Show management and scheduled through NTEA’s public relations agency, Simpson Communications LLC. Availability is limited and not guaranteed. To request the opportunity to hold a press conference or other media event at The Work Truck Show, please submit the Press Conference and Media Event application by Dec. 7, 2018. After receiving your application, Show management will email you by Jan. 11, 2019 to let you know if your request has been approved. Details confirming date, time and location will be included. How can my company be included in The Work Truck Show Ride-and-Drive? Please contact NTEA Director of Fleet Relations Chris Lyon at 248-479-8196 or chris@ntea.com.